When looking for a web hosting plan, you will find a lot of companies offering unlimited hosting. This plan gives you unlimited disk space, bandwidth, and no cap of websites hosted on the account. This makes it easy when shopping for affordable web hosting. You won't have to worry about any overcharges. Having not enough bandwidth could result in your site being shut down. If this does happen it may require more money or you will have to wait until you next billing cycle. As most of the affordable web hosting does offer unlimited services. Do take note that all of these plans are shared hosting. Which isn't necessarily a bad thing, just be aware of how a shared hosting server works. A shared hosting server has hundreds of websites sharing the same resources. These sites work from the same network and IP address. This could cause some performance and email delivery issues. For all new sites and blogs, shared hosting is perfectly fine to get started with. Once you site becomes popular with a lot of traffic you will need to upgrade. Bluehost is the number one recommendation for WordPress hosting. They give you all the unlimited features, $200 in advertising, and CloudFlare content delivery. HostGator is the most reputable hosting companies in the industry. They give you unlimited space, bandwidth, and domains. 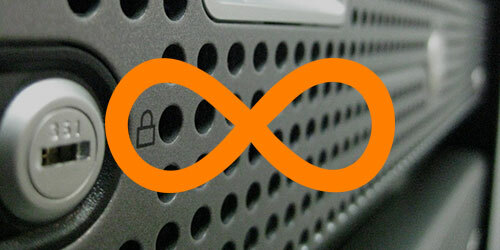 With the addition of instant backups, private SSL, with no yearly contract. HostMonster has the unlimited space, bandwidth, and domains. Where they stand apart is they include a 3 part protection plan. Span prevention, privacy protection, and backup protection. You will run across some terminology for "unmetered". When hosting companies use unmetered, they are referring to data transfers that are not tracked or followed. This means that you will not be capped or limited by the hosting company. There are a few things that you can do to help save some bandwidth. Optimizing images, streaming videos, and compressing scripts can save on file size. Saving resources with your images and graphics is the easiest way. You can use Photoshop or any online image compression tool. Also, watch the resolution of your images. Try to use the exact size that you are displaying to your visitor. To save space with your videos, consider putting them on YouTube. This way you are only saving space on your server, but you are also building brand awareness via social media. Disc space is easy, just compile all your scripts and resources and calculate the file size. Bandwidth, on the other hand, is a bit harder to determine. If you don't have your site online, you won't know how much you need. For a new site, your bandwidth will be very small. This is because you don't now how many visitors you site is going to generate in a month's time. The number of visitors factor into your upload and download resources. For those that do have a site online. Most web hosting companies have a report on their control panels that can give you this data. Run your site for a full month and analysis the data. If your host doesn't have a report, the next way to get a ballpark estimate is using AWStats. This is a free script that monitors your traffic, HTTP status codes, and referrals. This is usually always installed on all web server. Using AWStats you can analysis how much is being used for a particular day, week, or month. I have noticed that this figure is always lower than what the web hosting company records. Use it for a baseline figure. If your web hosting company is offering unlimited hosting, do read through their policy. They usually have some type of clause in there is you try to take advantage of the situation. If you are planning on doing some shady techniques, they will find you and shut you down. If you are going to start a useful website, you have nothing to worry about. Any of these companies will work perfectly for you. This gives good idea on selecting bandwidth. what a nice knowladghe regarding to select band width, and thank you for sharing. Thank you for the share, love what you do here.